Penguins are excellent swimmers, there is no doubt about that! But they are not born ready for life in the ocean. As you have seen in previous posts (Watch chicks break out of their shells here, or check out the tiny chicks during their weigh-ins here! 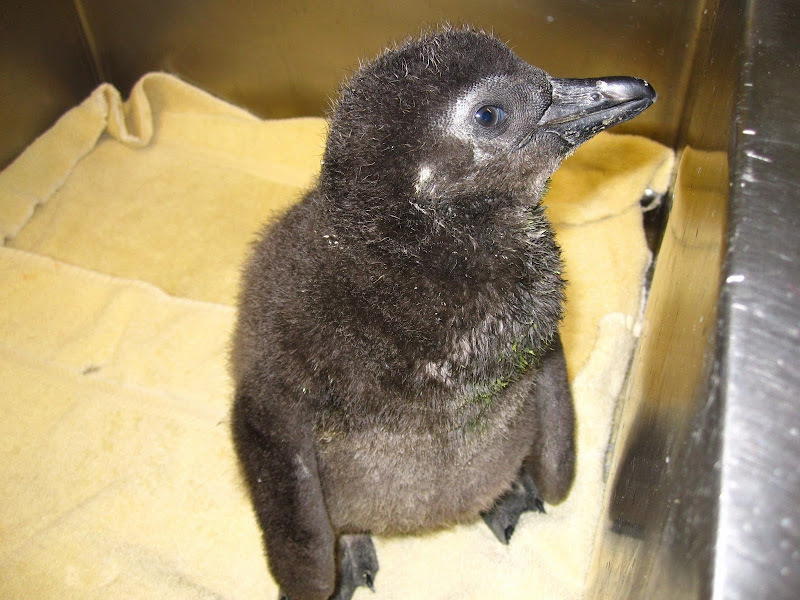 ), when penguin chicks hatch out of their shell they are very small and helpless. Here's a chick in the fluffy stage. Newborn chicks are initially covered in a sparse down, usually brown with a white chest. After a week or two this is replaced with a much thicker layer of secondary down. When the chick approaches full size the down is replaced by waterproof feathers, in a process called fledging. These chicks are fledging into their waterproof feathers! Once their waterproof juvenile feathers grow in we introduce them to swimming. We swim them in the pools behind the scenes for short periods and gradually increase their swim until they are swimming like pros. 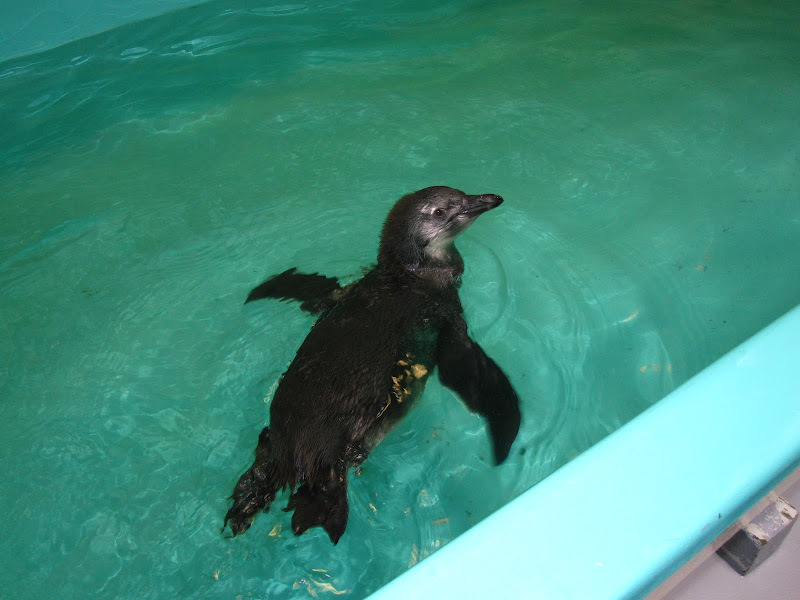 A juvenile penguin goes for a dip! Watch these videos to see our chicks swimming behind the scenes. Kind of funny to think about their first swim in a way that you might with humans. Very cute and appealing little ones. Do they ever get into trouble with their swimming or do they nail it from the beginning? Thanks for your question, Candace. 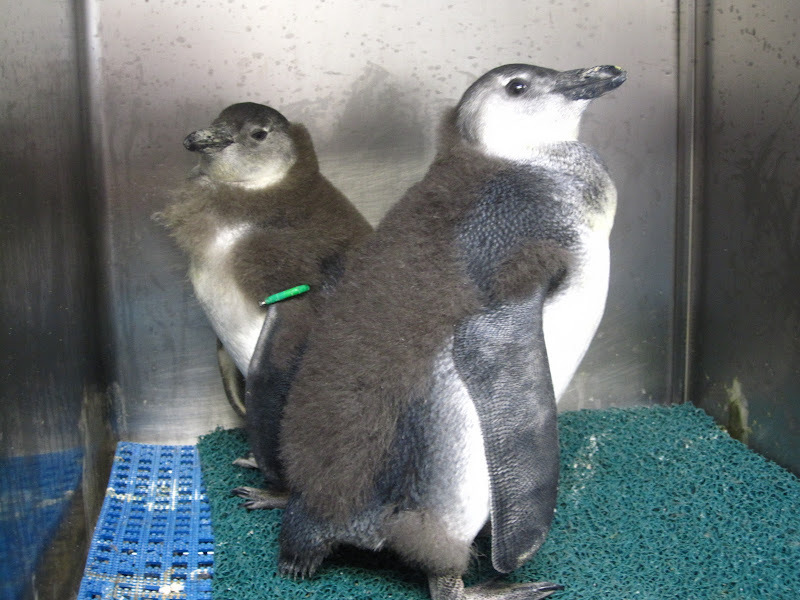 The penguins chicks have the mechanics of swimming down pretty much right away, but they need a little time to practice and get strong enough to manage in the main exhibit. Similarly, wild chicks practice by playing in shallow water while their parents are foraging before heading out into the open water. Swimming is still a new experience for these youngsters, we help them ease into swimming over time. Then pretty soon, they’re darting about the water, jumping off the rock islands and ready to live in the exhibit full time.